Yes, April 2018. This post may be long overdue, but I cannot even begin to elaborate enough on what an important and heartfelt event this was was for so many people. To expand a little more on the idea behind the workshop, while it was very much about learning new techniques, business perspective, and meeting other floral designers, the final day of the workshop would feature a fashion show benefiting Along Comes Hope and Team Matthias, two organizations with the mission of helping children and families affected by pediatric cancer. Susan McLeary, Amy McGee, Holly Chapple, Allison Ellis, Francoise Weeks, Gregor Lersch, and Hitomi Gilliam. Many thanks to each of you for your presence and master knowledge. 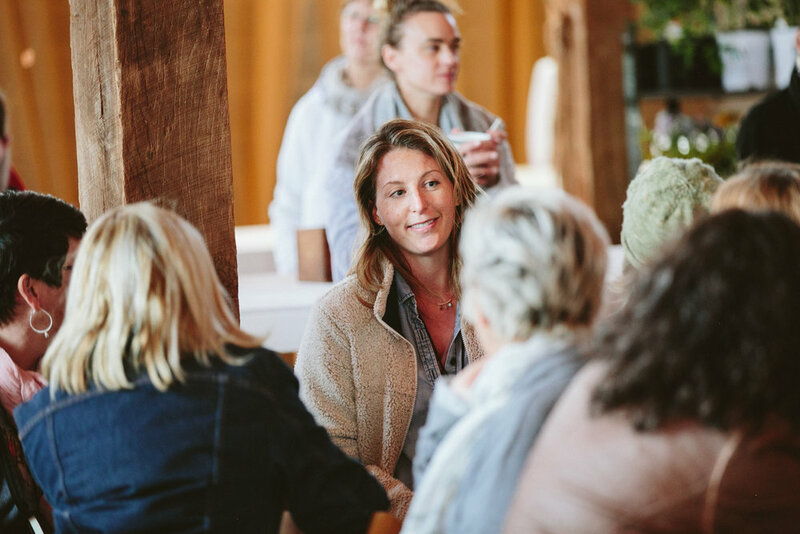 Holly Chapple, host of the workshop and “Flower Mama” as she is known by many in the industry, dreamed of utilizing Hope Flower Farm as a way to give back, to do something meaningful for a good cause. It was evident that Holly put her heart and soul into organizing this event. Our group spent the days leading up to the fashion show observing demonstrations and lessons from Holly, Gregor Lersch, Hitomi Gilliam, Francoise Weeks, Susan McLeary, and Allison Ellis. We used the techniques taught by the masters to create botanical couture to be worn by the fashion show models, who were all cancer survivors - many of whom were children that deserved, more than anything, a day to have fun and let their strength be known. It was an incredibly moving and emotional culmination. This gathering reaffirmed what I say about flowers and what I love most about flowers, which is that there is an emotion tied to every single bouquet or bloom that is given from one person to another. From our client’s point of view, they are often experiencing an overwhelming emotion - be it joy, love, or grief as we all inevitably face in life. Yet these emotions are all to be celebrated; maybe it’s a love to last a lifetime, a newborn baby, or a celebration of a life that touched others. In these moments, a florist channels that emotion and turns it into something of beauty to be honored, affirming the heart. What happened at the Flora & Fauna show was a celebration of the undeniable strength of every individual who walked the runway. Reflecting on it all, I look back to the day when I clicked ‘Register’ to attend this workshop with a completely different perspective. It was really not such a thing to have been nervous about in the grand scheme of life. But I guess, the moral of the story, is simply a reminder to do the things you’re afraid of - because you do have the strength to do them. I am honored & humbled to have been in attendance and want to give many thanks to Holly Chapple and Amy McGee, Along Comes Hope, Team Matthias, and Sarah Collier who captured the event with many beautiful photos. Holly was an incredible host - heartfelt, sincere, and genuinely happy for each one of us to be there learning together. Francoise teaching & apparently enjoying it! Me learning & apparently enjoying it! Cynthia Damico of Design in Bloom and myself sifting through a bucket to find the most exquisite bloom for the runway. Cynthia and I arrived at Hope Farm simultaneously, gave each other a nod and said, “I think we’re in the right place!”…“Phew - made a friend!” I thought to myself. Little one having a blast. I see a proud mom in the background capturing the moment. Bouquet by Jaclyn Millonzi of Feisty Flowers in Milwaukee. My creations were worn by Chapel Designer Lindsey Diminick, owner of Yellow Twist Design based in Maine. Meeting Lindsey and hearing her story was such a joy. LOVE that smile. Cathy Seeliger of Roses & Rice in East Quogue, NY made this incredible parasol. I don’t know how she did it, but I love it! Gregor Lersch makes completely unique designs, unlike anything I had ever seen before and unlike anything most people in Indiana have probably ever seen. Before the flowers were ever touched, Gregor spent hours crafting the intricate wire armature that makes the base of this bouquet. This journal will be a way for me to share what thoughts I have that may otherwise fall in the TL;DR category with the audience/small following of a) close clients who are really interested in my business, or b) friends and family who want to better understand what I do, or c) other floral designers to relate, get to know me and get a dose of florist humor. I’d like to get a little more personal with this audience too than I do on IG. While a huge piece of running a business is about staying on-brand, authenticity is huge for me. A couple planning their wedding has to trust their florist, and authenticity is key to building trust. Just to prove how authentic I am, I’m going to tell you that as I type I’ve just downed nearly one-third of a package of Oreos. They’re not the name brand Oreos, though still edible, but I am never buying anything but the name brand again. Now I’m back on brands. This paragraph has actually come full circle. Write something about flowers now, Angela! Raise your hand if you’ve ever wondered what you want to be when you grow up. Keep it raised if you’re still asking yourself this and you’re over the age of 22. Raise it a little higher if you’ve started down a path without an end goal in sight, not knowing where the chosen path leads. If your hand is still up, give it a little wave — Hi, nice to meet you friend, we’ve got something in common. In my *first blog post* I want to introduce myself and tell you the story of how I’ve come to find myself in the flower world. Warning – I’m going to talk a lot about myself in this post and I’m hyper-aware of it. I have a list of many more topics to cover that that will pertain to YOU – the brides and grooms, the vendors, and the flower lovers! That being said, if there are any topics you’re particularly interested in please leave a comment. I want to know what you want to read about! Back in my college days at Indiana University, it seemed like everyone around me knew exactly what they wanted to do after graduating. I, on the other hand, simply adhered to my family’s suggestion and went for a business degree. Unlike many of my classmates at The Kelley School of Business who had dreams of investment banking, I chose business because it seemed like the practical choice, and I would have a good chance of getting a decent job post-graduation. I had always worked hard in school. Studying, completing assignments and turning in work on time came easily to me, but when it came time to look for a job, I lacked direction and passion for any one particular field. Yet having to go through re-do’s in real life seemed so complicated to me, and I was deeply afraid of making a misstep. The first job I took was at a small software company as a data analyst, and there is no better way for me to describe the angst I felt from being pent up in a cubicle than to say I simply wanted to claw my eyes out. * Reading that back in my head, I know that sounds so dramatic. And PLEASE, if you’re reading this and you do work in an office or cubicle, know that I respect you and you’re probably doing much better, meaningful, more important work than I ever did. It was simply the wrong habitat and line of work for me. The line from that Smashing Pumpkins song that goes “Despite all my rage I am still just a rat in a cage” repeated in my head day in and day out and I. felt. it. (I realize I may not be reaching my audience with that song reference). Putting my headphones on and blasting it did get me through some tough days though. Again, I know it all sounds dramatic, and I did debate editing out this entire paragraph to read that my first job was “not my cup of tea” but hey, to downplay it like that is just not my style. *If any of my former colleagues happen to be reading this, you guys were GREAT, seriously! But yeah – I did hate that job. Without a degree in fine art, and not a ton of solid work experience at the age of 24, I didn’t have much success as I applied to jobs in creative industries. After some time, the family florist (Hi, Valerie!) suggested I apply to flower shops, which I had never thought of before. She was even kind enough to give me my first tutoring session on floral arranging. To this day, we love to talk flowers. Once I started working in a flower shop, the days didn’t seem to pass so slowly, the team became a second family to me, and while I initially feared the frequent social interaction with customers, it didn’t take long to realize how wonderful it feels when a customer’s breath is taken away by their flowers. Much of who I am today I discovered at that shop, and the people I met there helped me so much along the way. In a way, I feel like I grew up and found myself there. As I dove into the world of weddings, I had the “eureka moment” — Wedding floral design was where my love for floral design, service, and business savvy could come together. After months of pros/cons lists, agonizing internal and external debates, and some visits with mentors at the Small Business Administration, Fleurish was born. No longer am I left wondering how to use my business degree. My thinking has become that of a business owner – and thanks to my B-school background I’ve got mad skills in Excel that yes, are surprisingly useful as a florist. Since I’ve embarked on this small business journey, I’ve constantly re-evaluated my processes and workflow and will never stop looking for improvements. The creative side of my brain gets a ton of exercise looking for creative business solutions, but even more so as I challenge myself to heighten the artful quality of my floral designs. There are literally nights when I dream about color palettes and flower combinations. Since I started this venture in the fall of ‘17, it has blown my mind how I’m constantly learning as a small business owner, and how much I still need to learn— and I’m hungry to keep learning (like I touched on above, school was my favorite). This path I’ve been on has been pretty bendy and bumpy, but it does feel like I’ve found a home in this business. It’s been empowering to know I’m building something, growing something, with every decision I make. When I’m not putting my mind, body and soul into this budding flower business, I spend a lot of my time out in the yard, though only when Indiana graces us with beautiful weather - I don’t do cold. The garden was a big project for my husband and myself last year (I’m hoping to incorporate some homegrown blooms in this year’s bouquets and I’ve got another blog post in the works about this!). Patrick and I love working on our home together, exploring Indy’s culinary offerings, traveling, and spending time with our families; however, our most favorite thing in the world is enjoying time with our fur baby, Sadie. Teaching her to bring the frisbee back to us after she catches it has been taking up bits of free time (for the last 3 years, but I’m not giving up), and we’re hopeful that she’ll eventually learn how to play a proper game of fetch. I’ve also tried to keep up with painting classes when there’s time by attending watercolor classes at the Carmel Art Education Studio. I’ve found that the principles of art that I’ve learned and practiced in these classes is 100% transferable to the world of flowers. If you’re still with me, thank you so much for listening! As I mentioned above I will keep my future posts focused on your interests – so please leave me a little insight in the comments if you’ve got a hot topic!